Tom drove in from Palos Verde to join us in the morning on the 3rd day of my birthday desert roadtrip. He's usually incredibly prompt, like to the minute, and so I chided him some when he drove up two minutes past 7a. He sort of slumped his shoulders with a, "Yeah..." but it was all in good fun. It was the beginning of what looked to be a fine day, with some blue skies and scattered clouds, visibility better than we'd had the day before. Even better, today was my actual birthday. We had camped just outside the south entrance to Joshua Tree NP, in one of several large dirt clearings west of the pavement where one can legally camp for free on BLM land. Since we were planning to camp again here a second night, the three of us piled into Tom's Element for the drive north into the park. Our destination was another P1K in the Eagle Mountains, this one inside the park boundary. The summit can be reached from a number of directions, including from the east starting near the end of Eagle Mtn Rd outside the park. The shortest route is from the north starting from near the end of the Black Eagle Mine Rd, a 4WD route found inside the park. There was some concern that a portion of this going through a wash might require more clearance than we possessed, but with a modest amount of undercarraige noise that seemed to cause no significant damage, we managed to drive 10mi along this road which took us back outside the park and on BLM land a short distance. Starting out at 8a, we followed the deteriorating road east a little ways further. An abandoned plastic shower bag hung from a bullet-ridden sign, no longer readable. We couldn't tell how long the bag of water had been hanging there, but it didn't seem all that long. Who might have left it out here? Forgotten or intentional? The questions would remain unanswered as we left the bag just as we found it for the next visitors to puzzle over (or not). Chances are it will get a few bullet holes at some time, just like the sign. We left the road, turning SSE to follow a broad wash towards our summit for almost three miles. The sandy wash made for easy hiking and apparently not bad for tortoise burrows, too. A number of large holes we passed by appeared to be partially filled in, perhaps abandoned. We debated whether the tortoises had back-filled the holes after entering and paused to let Karl examine one of them. A damning photo of him potentially harassing an endangered species is all we got from the exam. There was no definitive answer to this question either, but my bet was on abandoned burrows. The wash narrowed as we got closer to our peak, providing a little easy scrambling but no significant obstacles. About a mile northwest of our summit we climbed out of the wash/canyon matrix to climb a little over 1,000ft up rocky slopes to the top. The views opened up considerably as we gained altitude and though we had better visibility than the day prior, there was still much haze to limit the distance one could see across the desert. We came up over one false summit before seeing the highpoint not far beyond. We first made our way to the lower SW summit before finding we'd bypassed the highpoint to NE. In all we spent about two hours covering the four mile distance to the summit. A Richard Carey party had left a register in 2012, ours making only the second entry. Not quite as old as 1980s MacLeod register, but it would have to do for the moment. As the three of us piddled about the summit, I was eyeing another P1K with interest, just under 5mi to the SW. Now, five air miles is a long ways, and even I was a little discouraged by this. This other unnamed summit, Peak 3,994ft, had actually been our original target today, but since we were able to drive as far as we did I chose the more remote summit. But I hadn't given up on the idea of tagging both in a long loop. Roughly calculated, it would be 4mi (that we already did) + 6mi (to the other summit) + 7mi (for the return). Not an unreasonable amount of desert miles, but would certainly make for a long day. It would also likely negate our side visit to Mastodon Peak that I had already promised to Tom. The other two were keenly aware of what I was studying, doing nothing to discourage me. They figured that since it was my birthday they would go along with whatever fool plan I cooked up, difficult as it might be. Karl later admitted to having already started to ration his remaining water expecting that we'd be heading off that way. And while I really did want to tackle that other peak, my thinking took me in another direction. Yes, it was my birthday, but there was no reason we shouldn't all be able to have a fun day. Besides, as I've come to rationalize more and more these days, it gives me another reason to come back for another visit. I've pretty much given up the idea that I'll ever "clear out a location and never come back" as my lowering standards simply provide ever more opportunities all over the state. In its stead, I hit upon another plan to keep us busy for a few extra hours. 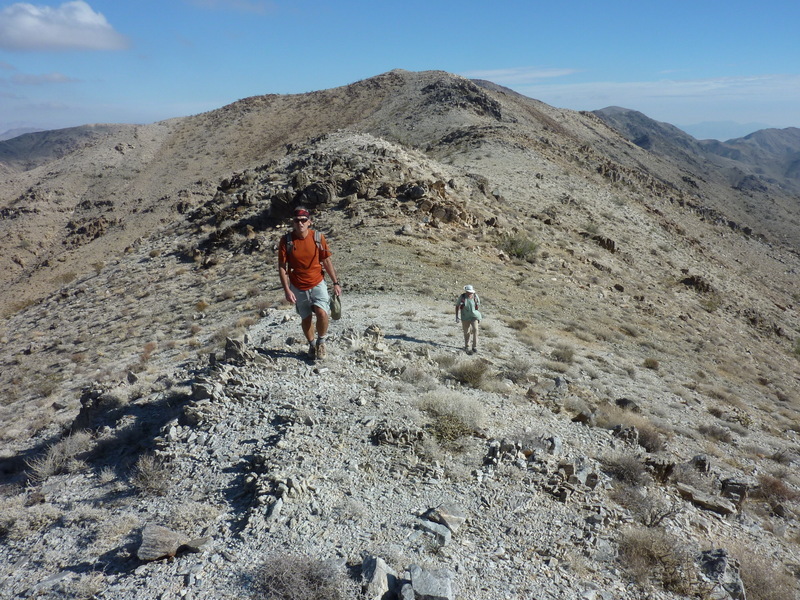 Only a mile and half to the west was an intermediate summit that looked to have sufficient prominence (300ft) to count as a bonus and I suggested we hike the ridgeline between the two and then follow another ridge heading north back towards the desert floor and our car. The others were happy to oblige and just after 10:30a we headed off the west side of the summit. It was a great plan, I think, and I suspect the others would agree. We had a very delightful hike running the ridge between 3,300ft and 3,900ft. The terrain was easy enough and the ridge high enough to afford us what views were to be had. It took just under an hour to reach the highest point at 3,902ft which turns out to have a benchmark labeled "SWEET" on the topo map (didn't know to look for a benchmark at the time). Better, there was a 1981 MacLeod/Lilley register with only one other visitor dating to 1996. We dropped north down the second ridgeline, reaching another local highpoint labeled 3,812ft on the topo map. This, too, had a MacLeod register dating to the same day as the previous one. With less than 150ft of prominence it doesn't qualify as a separate peak by today's general standards, but that never seemed to stop the dynamic duo. This register also sported a second entry, but by a different visitor this time, dated 2006. Continuing north, we descended to a saddle and then up a third summit, Pt. 3,638ft. This one had more prominence than the previous but less elevation, still we half expected to find a third register here. We did not - evidently MacLeod had not carried sufficient stores of glass jars in his pack that day. Our descent continued for another 1.5mi on a more gentle decline before reaching the desert floor once again. From here we had little more than a mile to return to the car and by 1:30p we had concluded the day's longer excursion. We drove back out to the main park road, then south to the Cottonwood Springs TH. It was still only 2:30p by this time, leaving us two hours of daylight - plenty of time for the easy 2.5mi RT hike to Mastodon. Karl and I had both visited this summit at different times in the past, this visit primarily to satisfy Tom's quest of the LPC summits. There is a fascinating little spring found just past the parking lot, with tall palms and even taller cottonwood trees, whose leaves were a golden fall color. We took about half an hour at a leisurely pace to make the popular hike to Mastodon. Several dozen folks were out on the trail, one of the busiest in the park. Another party was relaxing just off the summit when we arrived for the easy class 3 scramble to the highpoint. We stayed only a minute. The summit isn't very high and not much of a peak at that, more like the highpoint of an unusually large cluster of rocks found in area around the spring. While the other two returned to the trail via the route we'd ascended, I explored an alternate route directly down to the Mastodon Mine on the west side of the peak. The Park Service has done an excellent job of sealing the mine entrance so that no one could possibly break in without a blowtorch or some serious equipment to get through the heavy iron bars that now close it off. The others were soon in joining me. During the second half of the return loop, we left the trail to follow a sandy wash into a very fun section of class 3 scrambling that we more or less fell into without any prior info. It had some interesting problems to overcome and a large chockstone tunnel among its features. It led us to the backside of Cottonwood Spring where we could just barely see a small trickle of water emminating from the rocks. We could have scrambled down further and returned to the trail through the palms, but that would have meant traveling through the sensitive area marked off by cables along the trail - bad karma, that. Instead we sidehilled to the west a short ways and then down a use trail leading to the parking lot where we'd started. Tom provided celebratory beers at the conclusion. All in all, a wonderful way to spend a birthday. I even got presents and birthday (cup)cake back at our camp outside the park. Nice!